The Wadi Rum Protected Area, a UNESCO World Heritage Site in the south of Jordan. Photo taken by Jurick Wessels, @jurickwessels on Instagram. There are five UNESCO World Heritage sites in Jordan; four of the sites are considered cultural sites and the fifth is a mixed site, qualifying as both a natural and a cultural site. In this post, we’ve written a little bit about what makes each site special as well as how to get to the site. If you have any questions, or if you’ve visited the site already and you want to share some tips for future visitors, please send us a message. Petra’s Treasury after dark. Photograph by Mustafa Waad Saeed, distributed under CC BY-SA 4.0 license. The ancient city of Petra is the most popular tourist destination in Jordan and it was named a UNESCO World Heritage Site in 1985. 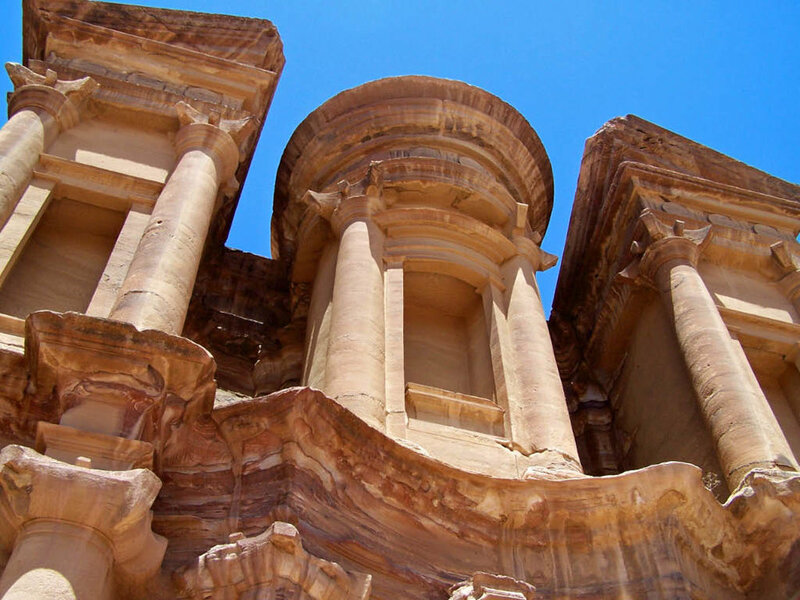 What makes Petra stand out is the ancient tombs which were carved out of the sandstone rock formations when Petra was a thriving city and center of trade between Arabia, Egypt and Syria-Phoenicia, whose merchants carried goods from all over Africa and Eurasia. The most famous sites at Petra are known as The Treasury and The Monastery. The Monastery at Petra. Photograph by Tom Neys. The Treasury is Petra’s most famous tomb due to its size, location, state of preservation, and appearance in popular culture. In film, The Treasury is most well-known for its appearance as the entrance to the temple housing the Holy Grail in Indiana Jones and the Last Crusade. Some visitors to Petra are surprised to learn that the inside of the tombs are architecturally uninteresting. Although you aren’t permitted to enter The Treasury, you can enter other tombs and have a look around. The name ‘The Treasury’ comes from the belief that the urn at the top contains an ancient treasure. Groups have tried to access the loot by shooting through the urn however scans have shown it to be solid sandstone. If you look closely, you can see the damage caused by the bullets. The Monastery is an extremely impressive architectural site, especially at sunset. The Monastery is a bit far from from the Treasury and even further from the Visitor Center. If you are planning to visit the Monastery (which you should! ), consider wearing good walking shoes. There are many other lesser known but interesting and beautiful sites to explore at Petra. Make sure you leave enough time to visit most of them. Too many visitors leave only enough time to visit The Treasury but you could easily spend two days covering the entire site. Due to its popularity, it is quite easy to get to Petra from anywhere in Jordan. Petra is located next to the town of Wadi Musa in the south of Jordan, along the King’s Highway. From Wadi Rum, there is a tourist bus that departs each morning around 9:00 AM and travels to Wadi Musa. The cost is 8 JOD per passenger (Oct 2018). If you want go to Petra later in the day, a taxi from Wadi Rum to Amman costs 40 JOD. From Aqaba, you can take the tourist friendly JETT buses, the cheaper local mini-buses, or arrange a taxi for around 60 JD. Bethany Beyond the Jordan, also known as Al-Maghtas is believed to be the location where Jesus of Nazareth was baptized by John the Baptist. It was named a UNESCO World Heritage Site in 2015. This site is located in the Jordan Valley, to the east of the Jordan River. It is about 9 km from the coastline of the Dead Sea. The site is split into two areas; (1) Tell Al-Kharrar and (2) and the area close to the river where the churches of Saint John the Baptist were located. Tell Al-Kharrar, also known as Jabal Mar-Elias (Elijah’s Hill), is thought to be the location of Elijah’s ascension as described in the Hebrew Bible. As the story goes, Elijah was a prophet and was not on good terms with King Ahab in Israel. When Elijah grew old he, along with his successor Elisha, decided to leave Israel and settle in modern-day Jordan. Upon arrival at the Jordan River, Elijah parted the waters with his cloak allowing them safe passage. Once they reached the other side, a fiery chariot is thought to have swooped down and carried Elijah to Heaven. Jesus of Nazareth is thought to have travelled from Nazareth to come to John to be baptized. Despite John’s initial objections, he agreed to baptize Jesus at Bethany Beyond the Jordan. Ever since, this historical and spiritual site has been a popular place for pilgrims, hermits, and monks to reside. During the Six Day War in 1967, the site became off limits to pilgrims due to both banks of the Jordan River being militarized. In 1994, Prince Ghazi of Jordan restored access to the site. Ever since, it has been a popular site for pilgrims, tourists, and archaeological investigations. In 2000, Pope John Paul II became the first pope in history to visit the site. Since then, Pope Benedict XVI and Pope Francis have both visited the site along with many world leaders and members of royal families including Vladimir Putin and Prince Charles of the United Kingdom. Bethany Beyond the Jordan is close to the Dead Sea and thus it is best to combine a visit to both sites. Buses travel between the Dead Sea resort area to this site each day. If you are not intending to stay in the area, this UNESCO site is not too far from Amman and a taxi can be hired for a reasonable price. Further, Bethany Beyond the Jordan is not far from the Allenby Bridge Border Crossing which connects Jordan with the Israeli city of Jericho. Free entry to Tell Al-Kharrar is included with the Jordan Pass. Quseir Amra. Photograph by JoTB, distribute under CC BY-SA 3.0 license. Quseir Amra is a fortress built by the Ummayads in the 8th century. It is one of Jordan’s five desert castles, all of which are located in the remote, north-eastern part of the country. Today, very little of the castle remains but luckily, Quseir Amra was not only used as a military post. The Ummayad caliphate had built what is known as a ‘pleasure-palace’ which today remains very well preserved. Animal playing a stringed instrument at Quseir Amra. Photo taken by Simon Bowden, @sj_bowden on Instagram. Inside the Pleasure Palace, you can see frescoes painted on the walls which depict hunting scenes, animals and birds, and inscriptions in both Arabic and Greek. In the apodyterium (the changing room) you can see an interesting painting with animals playing musical instruments and engaging in other human activities. Quseir Amra was abandoned when it was rediscovered by the Czech explorer Alois Musil in 1898. Although you may want to thank him for the discovery, you may want to reconsider. He tried to steal one of the most important paintings inside known as the Painting of the Six Kings, permanently damaging it in the process. Quseir Amra is located in a remote area, not close to any town or village that you are likely to find yourself in during your visit to Jordan. If you don’t have your own vehicle, the easiest way to visit this site is to hire a taxi in Amman. The journey should take about one hour. Entry to this site is free with the Jordan Pass. Without the pass, the entrance fee is 3 JOD. Mosaic at Um er-Rasas. Photograph by Professor Bjorn Anderson. Um er-Rasas (also known as Kastron Mefa'a) is an ancient settlement close to Madaba that was named a UNESCO World Heritage Site in 2004. This archaeological site was once inhabited by the Romans, Byzantines, and Early Muslims. The site began as a Roman military camp in the 3rd century and it became a town by the 5th century. The site contains the remains of 16 churches and remains largely unexcavated. Stylite tower at Um er-Rasas. Photograph by Professor Bjorn Anderson. What makes Um er-Rasas special is its mosaics. The most important mosaic is the floor of the Church of Saint Stephen. This mosaic is perfectly preserved and wasn’t discovered until after 1986. 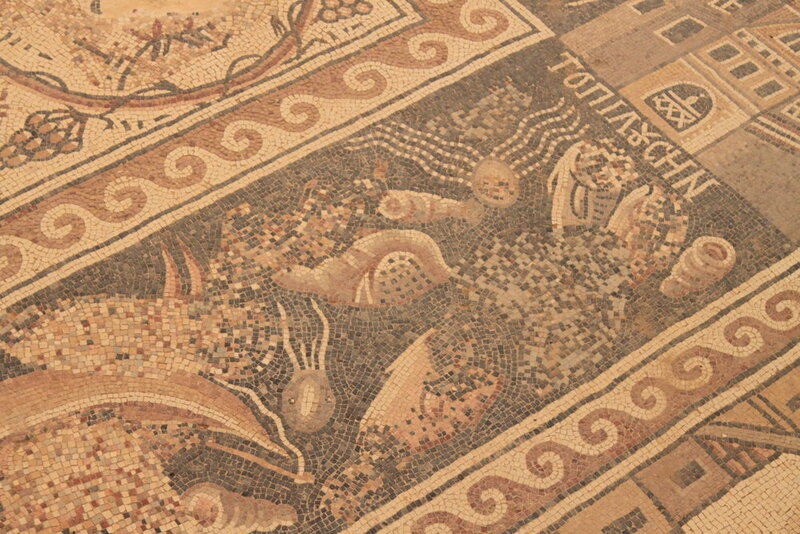 The central scene in the mosaic is a fishing and hunting scene. A side panel contains a map of the main cities in the region including Philadelphia (Amman), Madaba, Kerak, Gaza, Jerusalem, and more. The mosaic is the largest in Jordan and the work dates back to the year 785 AD. 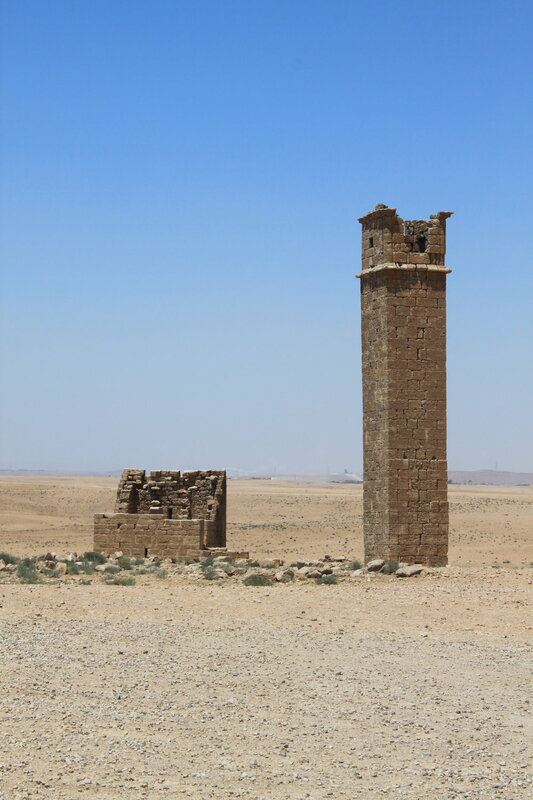 Another interesting aspect of Um er-Rasas is the Stylite tower. This tower is around 14m tall and is believed to have been used by Stylite monks as a place to live. It is believed that the monks lived in a room at the top of the tower. The entrance to the tower was not located at ground level and a ladder would have been required to access it. The tower is decorated with Christian symbols from the Byzantine era. It is not possible to reach Um er-Rasas by public transportation. The closest city to Um er-Rasas is Madaba where it is possible to arrange a taxi. If you are driving, the distance from Madaba to Um er-Rasas is around 30 km and the journey takes about 40 minutes. Um er-Rasas is an included attraction with the Jordan Pass. Without the Jordan Pass, the entrance fee is 3 JOD. If you aren’t able to visit Um er-Rasas, you can visit the site using Google Maps. Wadi Rum Landscape - Photo taken by our guest Hilda Berenice Hernandez Ramirez from Mexico. Our guide Raid Abdullah on top of one of Wadi Rum’s peaks. Photo taken by our guest Cristi Trufas from the USA. The Wadi Rum Protected Area was named a UNESCO World Heritage Site in 2011 and it is the only UNESCO World Heritage Site in Jordan that meets the criteria in terms of both natural and cultural excellence. Wadi Rum is a desert area filled with a vast number of impressive geological structures including gorges, natural rock bridges, sandstone cliffs, mountains, caves, and more. Three of the tallest mountains in Jordan are located within the Protected Area. Jabal Ram and Jabal Umm Ishrin, the second and third tallest peaks, are located near to the Wadi Rum Village. Jabal Umm ad Dami is the tallest mountain in Jordan and it is located in the southern extreme of the Wadi Rum Protected Area, near to the border with Saudi Arabia. Wadi Rum’s cultural significance comes from its collection of petroglyphs, inscriptions, and other archaeological findings made on the site. People have been living in Wadi Rum for more than 12,000 years and have left their mark on the landscape by leaving behind more than 25,000 rock carvings and 20,000 inscriptions. The inscriptions are made in four different Northern-Arabian scripts and demonstrate the transition from hieroglyphs to alphabet. The most popular inscriptions are the Anfaishiyya Inscriptions which are visited on our Wadi Rum Jeep Tour. Also, Wadi Rum is specifically mentioned in the Quran as the location where Iram, and the tribe of ‘Ad lived. If you are planning to visit Wadi Rum, please click here to learn more about our Wadi Rum Tours. Travelling by Camel in the Wadi Rum Desert. Photo taken by Jurick Wessels, @jurickwessels on Instagram. Wadi Rum is most easily accessed from Aqaba and Petra. The journey from Aqaba to Wadi Rum is around one hour. There is a local bus that travels between Aqaba and Wadi Rum each afternoon. If you would like to come by taxi, we can arrange a taxi for you starting at 25 JD. From Petra, there is as early morning tourist bus each day that travels to Wadi Rum. You can reserve a seat on this bus by contacting your accommodation in Wadi Musa. Taxis can be arranged for 40 JD. If you are coming from somewhere else in Jordan, or from the Wadi Araba Border Crossing with Eilat, please send us a message and we will let you know your options for getting to Wadi Rum.